Did Marvel Just Introduce a Stan Lee Spider-Man? While Stan Lee passed away a bit over a month ago, Marvel Comics paid tribute to the legendary writer, creator, editor and all-around comics ambassador in titles released today, each one emblazoned with a somber black armband running along the top as well as several black pages and stunning piece of art by Phil Noto featuring Lee. However, in Spider-Geddon #5 Marvel may have paid tribute to Lee in another, deeply moving way. Spoilers for Spider-Geddon #5 below. One of the major elements of Spider-Geddon is that the book is packed with Spider-Beings from every corner of the vast Marvel universe. We're talking Spider-UK, Octavia Otto, Spider-Woman (May "Mayday" Parker of Earth-982), Spider-Gwen, Spider-Ham, and many, many, many more. The issue even gave fans a character fans who have played Marvel's Spider-Man will recall, none other than Spider-Cop himself. But tucked into a couple of panels in the issue this week was another version of Spidey, one without any specific indication of his actual identity but one that looks very familiar with white hair, white moustache, and big glasses -- one that looks an awful lot like Stan Lee. Check it out below. In the image above, this Stan Lee-like Spidey can be seen on the left of the image, just behind Spider-Man Peter Parker's shoulder positioned almost as though he's proudly looking on as Peter speaks. A coincidence? Maybe. But the same Spidey appears again in the issue while Miles, Doctor Octavius Otto, and Peter discuss how they plan to defeat the Inheritors, again looking on. It's hard to dismiss the striking similarity this new, unknown Spider character has to Lee and if this really is a Stan Lee Spider-Man (and, it's worth noting that this Spider is definitely not Spider-Cop -- different colored moustache) it's an incredibly fitting and moving tribute to the late comics legend. As fans well know, Lee co-created Spider-Man and the iconic character, while only one of many Lee brought to life over his multi-decade career, is deeply associated with Lee. 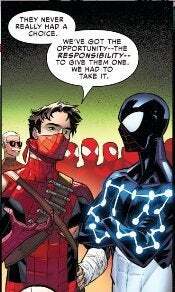 Honoring Lee's memory by giving him a place within the Spider-Verse as one of the Spider-Folk is a pretty perfect tribute. It also embraces an idea that Lee often espoused, that anyone can be a hero. It's a message that is perhaps most loud and clear in Spider-Man stories as well as a message that is part of another recent Lee cameo -- that in the Spider-Man: Into the Spider-Verse film. In that cameo, Lee sells Miles Morales his own mask, telling the young hero "It always fits, eventually." While speaking to ComicBook.com's Chris Killian at the Spider-Verse junket, producers Phil Lord and Chris Miller opened up about Lee's cameo. "I think that it's a really warm cameo, and we've seen it play with an audience for a few months now, and it's always been a welcome presence," said Lord. "People are always excited to see him. We've seen it since then with an audience, and there's still a kind of joy in it, even though we all miss him. The audience basically welcomes him back. It's like seeing an old friend." "I feel like it's taken on an added poignancy since we lost him, but it still as a moment still plays to cheers, but now with some 'AHs', and then some laughs," added Miller. "I'm just happy that we got to put him in a really integral spot of the movie, and sort of at a really important, emotional moment for the movie. And be able to honor him in a way that felt like it did him some justice." Spider-Geddon #5 is available now. Do you think this mystery Spider is Spidey Stan Lee? Let us know your thoughts in the comments below.